Gigabyte shows off its line of AMD A75 based motherboards for the Llano desktop APUs. It includes the GA-A75-UD4H, GA-A75-D3H, GA-A75-DS3P, GA-A75M-UD2H, GA-A75M-D2H, GA-A75M-S2V, and GA-A75N-USB3 mainboards. GIGABYTE A75 series boards features an AMD A75 'Hudson' chipset supporting the latest 32 nanometer AMD A-Series APUs or Accelerated Processor Units. These processors are the first ever to combine a DX11-capable, high performance graphics processor with a choice of a dual or quad core CPU in one silicon die, offering a 3D gaming and multimedia experience similar to a discrete graphics configuration. Supporting Microsoft® DirectX® 11, OpenGL 4.1 and OpenCL 1.1 standards, AMD A-Series graphics deliver a 3D gaming experience similar to entry-level discrete graphics card solutions, with 3DMark Vantage (Performance setting) scores of around 4000 points. Using GIGABYTE's Easy Tune™ 6 utility, users can overclock the AMD A-Series APU to gain further performance enhancements over stock settings, offering 3DMark Vantage (Performance setting) scores of over 6000 points*. The AMD A75 series platform showcases AMD Dual Graphics technology, allowing users to further boost 3D graphics performance by adding an additional discrete AMD Radeon™ HD 6000 series graphics card to the system. This unique Dual Graphics technology means users can enjoy higher frame rates on the latest gaming titles, utilizing the processing power of both discrete and onboard graphics processors. 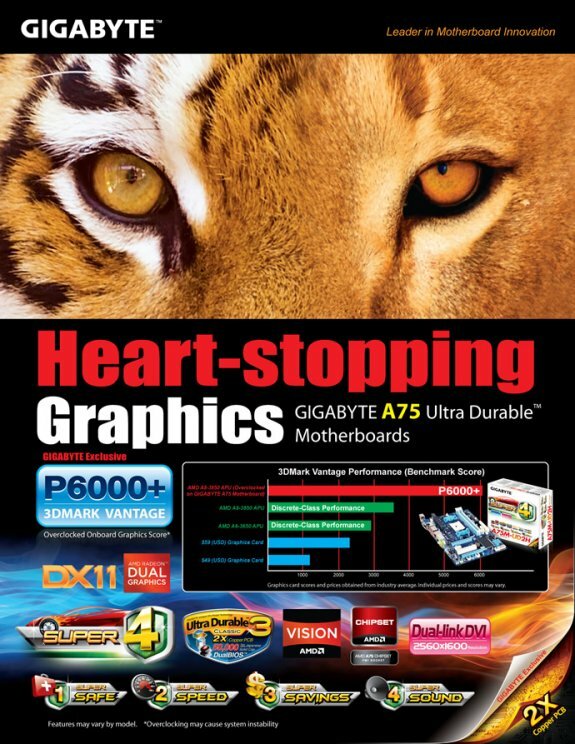 All GIGABYTE A75 series motherboards are part of the GIGABYTE Super4™ motherboard range, and as such are equipped with the very best components and a comprehensive range of unique features that guarantee flawless system stability and extended product longevity without compromising on performance, features and device connectivity. GIGABYTE Super Safe includes features that guard against system malfunction and ensure extended system longevity, including GIGABYTE DualBIOS™ to ensure that you never experience system failure due to BIOS corruption. Additionally, each USB port has its own dedicated power fuse that prevents unwanted USB port failure, helping to protect USB connected devices from malfunction and safe guard your important data during transfer. All Super4™ motherboards also use solid capacitors that guarantee system longevity with a minimum 50,000 hr lifespan. GIGABYTE Super Speed ensures that you’re always on the cusp of PC performance, data transfer and device charging speeds. GIGABYTE 3x USB power means better device compatibility and faster charging on USB connected devices like portable storage devices without needing to use two USB ports. The additional power provided by 3 x USB Power allows iPad, iPhone and iPod devices to charge up to 40% faster compared to standard USB implementations, while On/Off charge allows fast device charging even when your PC is on standby or turned off. All GIGABYTE Super4™ motherboards are equipped with the very best quality components that ensure that you PC is running at maximum power efficiency. Lower RDS(on) MOSFETs reduce energy wastage through unnecessary residual heat dissipation. This amounts to tangible energy savings which are beneficial for both end-users and the environment without impacting system performance. As the HD multimedia revolution continues to gain momentum, so too must hardware standards in audio quality. All GIGABYTE Super4™ motherboards offer excellent 7.1 surround sound audio backed by a proprietary converter that is able to achieve 108dB noise ratio (SNR) playback quality. This means that users will enjoy a better audio experience with lower levels of noise and hiss when enjoying the latest HD content.